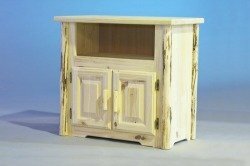 All our furniture is available in either Natural Finish (Ready to Varnish)... Laquer... or Glacier Style finish. 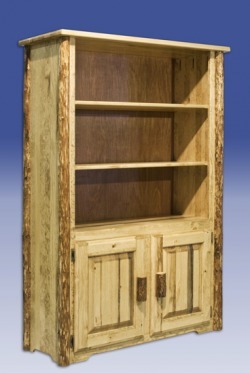 This rustic style bookcase with hand-peeled, lodge-pole pine accents is sure to stand out in any home or office. 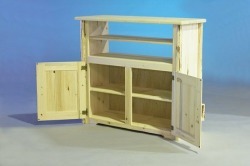 The 14" deep main shelves have plenty of room for books, collectables and family heirlooms. The top shelf is 8" deep allowing for placement of taller items on the shelf below. 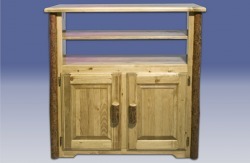 Two, raised panel doors with log accent pulls conceal a large (app. 20" x 30") storage area. 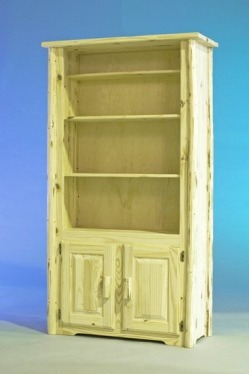 The bookcase shelves, side panels and face frame are constructed using solid pine, edge glued panels. 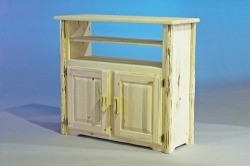 Log cabinet can be used for TV Stand or Utility Cart in Kitchen. Measures 31W 16D 29H. One of our most popular items with many uses.